Unit 17 Lot 58; TOT ID# 1604. This spacious and private ocean front home has many new features thoughout the house. Sculpture Point is a large home with three bedrooms, 2.5 baths as well as one fireplace in the living room. The master bedroom, located upstairs, has a Cal King bed. Both downstairs bedrooms have king beds. The dining room is surrounded by windows overlooking beautiful white water views. Take a stroll on the nearby bluff top trail and enjoy the panoramic scenery unique to The Sea Ranch area. This home also features a spacious kitchen with new appliances and an 8 burner gourmet gas cooktop. Owners have upgrades throughout the home and all new living room and dining room furniture, a high tech AV system and a 65" Smart TV with many television upgraded channels and sports packages. The living room windows seats have the same beautiful views as the dining room. Outside is a new deck and a brand new hot tub for your relaxation and enjoyment. Due to the close proximity to the ocean, the homeowner suggests guests age 12 and older occupy this home rental. Free Wireless Internet available. Bed linens and towels are included with this home rental. Wonderful house in an unbeatable setting. Great kitchen, comfortable living room with wood burning fireplace, very comfortable beds. Love the hot tub. Would be nice to have access to the fourth bedroom, in the event of more people. Overall a great experience and we look forward to a return visit. We have rented this house for more than 10 yrs. Every year we come there has been up grades. Great house and our family can appreciate the upgrades. As a family of six (grandparents, parents and two children) we could not have found a more beautiful, open and accommodating home and location. The panoramic views make you feel like you are connected to the outdoors. We made many meals here together and found the kitchen perfect! Loved hearing the granddaughters plunking away on the piano. The second floor master and views spectacular and like a mini-retreat! We did covet the second (locked and private) master which would have made it even more perfect. A very small annoyance was the sticky front door lock which sometimes took up to 10 minutes and multiple attempts to unlock, and a couple more towel racks in the bathrooms would be greatly appreciated as we needed a place for our towels to dry out between uses. Otherwise.... absolutely perfect! Had a wonderful stay at this spacious, gorgeous home with a magnificent whitewater ocean view. Beautiful interior woodwork and fabulous, well-equipped kitchen. We will be back! As Beautiful as Anywhere on Earth. We have been going to Sculpture Point for over 30 years and it just seems better and better every time! The house is magnificent and the views are incredible. It is impossible to walk into Sculpture Point and not feel relaxed and without a care in the world. DO IT!! This is the third time we have rented this house and we plan to do so again in the future! The views are amazing! We love having wine and cheese out on the deck in the afternoons. If it’s too chilly, there are window seats all along the back of the house. We love our visits here. Although house is very large it worked well for only the two of us. Only problem was weak water pressure in the master bathroom shower along with weak hot water. Otherwise, exceptional property with panoramic views down the coast and private location away from the bluff trail. Exceptionally bright on a sunny day. Very well equipped and large kitchen. This is the second time renting this home. The view is amazing - the home is spacious enough to find your private space to finally finish the book you started in June ! The weather was sunny warm and the water view were spectacular. We did a day visit to the little town of Point Arena visiting the lighthouse and Fishing pier . We are looking forward to next year . Sculpture Point is an exquisite property with a phenomenal southern white water view. The property is well laid out with plenty of nooks to read or watch the ocean. We're very familiar with the surrounding trails as we've stayed here in the past when I was growing up. The only disappointment is the first floor master bedroom is locked off. It's not clear in the description that the new suite is upstairs and while it's nicely appointed, the bathroom is minuscule and there is no southern view. The remodel took space from the garage so there's not enough space to fit one normal-size car. The deck furniture is plentiful and nice. We ate many meals outside and took advantage of the lounge chairs to soak up the view. We were looking for 4 days of no stress, no traffic, and beautiful scenery. The house is 4 star for certain. Sculpture Point is so Great! We went back to Sculpture Point again this year. We love the house and the views! It is also a short hike to great spots to get into the Ocean which is important to me! We look forward to visiting again next year! Beautiful spot, fabulous view. Had some trouble with the heater but the rental company made everything right and the owners were most gracious. This very private home delivered more than we expected. We have been coming to Sea Ranch for over 12 years and have rented many different homes. This is one of our favorites. Spectacular view of the water, very comfortable, beautiful and warm, well equipped kitchen for cooks, not to mention a large and spacious floor plan. We will rent this home again. Management was very responsive and helpful to any of our questions. We have been staying at this house for 10+ yrs. The new owner has made fantastic upgrades to the house including a new cooktop and spa. We where blessed with outstanding weather and can not wait for our next stay here. Looking for the ultimate get away. We discovered it at Sea Ranch . Home was stunning ! Views spectacular ! A must to redo ! We have stayed in this home before, and love its spacious interior and amazing down-coast views and exceptional privacy. The new hot tub and remodeled deck areas are fabulous additions. We had a great time once again. We could tell the home is still in a bit of a transitional state with the new owners, as the amenities and supplies were not as well appointed as they could have been. The windows were really dirty when we arrived, but Beach rentals was very responsive to get someone out to clean them for us the following morning. I am sure they will hit their stride soon- at which time, the house will be hard to beat! We had a great time relaxing, entertaining, and enjoying the beach! A perfect place to get away from the Bay Area. The home was beautiful! The view was beautiful!Once we discovered that the hot tub was not filled, we called property management and within an hour maintenance was out and had it going! The privacy on this property was pure Solitude! Sculpture Point is now our favorite! Gorgeous weather with a spectacular view ! a guest from Orinda, CA does not recommend this vacation rental. The house was wonderful with a stunning view, but it was mis-marketed/mis-advertised by the rental company. The master bedroom with jacuzzi tub with stunning ocean views featured in the on-line photos of the home on the rental company website was locked off by the owner and unavailable for us to use. We would have really like to have known this before renting this house. Beach Rentals management wants to sincerely apologize for the mis-marketed/mis-advertisement for Sculpture Point property. It has been going thru refurbishing recently, which resulted in change, and corrections have been made regarding the online description. We thank you for bringing it to our attention, and we anticipate many improvements with the property in the future. We had a fabulous time in this very large, spacious home with unparalleled privacy and great views. We coukd literally leave the blinds open and not worry about privacy- as there is no bluff trail behind you. If you have a big group,this home is a great choice. Note: one bedroom has 2 single beds, so not ideal for 3 couples. There is also a sofa bed available for use. Very big living areas make group gatherings very comfortable. And a fabulous set of window seats!! Home with a million dollar view ! it's white water ocean view ! Perfect house for a family and friends get together at Sea Ranch. Comfortable, large house with spectacular views and a well stocked kitchen. Beach Rentals is the best! The view of ocean waves this weekend was spectacular ! The Berry Home has an incredible view and is in the heart Sea Ranch of walking trails ! Fabulous House - Superb Location! We had a short stay, but the location helped us get the most of our stay; Berry House is within easy walking distance of several superb beaches (incl. the Marine Preserve) as well as the Ohlson Rec. Ctr. The house itself is really well-furnished, with beautiful view out every window, and at least a couple of families, of all ages, could share this house without ever feeling cramped. I've stayed at several houses at TSR - each unique & beautiful in its own right - but Berry is special! We could not have asked for a better home and location for our long weekend away from home. The view was breath taking and allowed for much needed relaxation as we listened to the pounding of the surf day and night. We were so comfortable in this well equipped home, and enjoyed nights by the huge stone fireplace playing board games and reading books. We would stay here again! Very relaxing with gorgeous ocean view. Walked for miles along on the paths along the coast. Location was perfect and the house was clean and comfortable. We really enjoyed our stay. We got to see the sights during the day and played board games at night. Very peacefull area and we loved seeing the Deer run through the back yard along with the amazing view. Great place to clear you mind. We also enjoyed reading the log books and reading the comments and poems people wrote. We will definitely be back! Loved the Berry House. Such a beautiful, spacious house, right on the bluff overlooking the cove. I look forward to returning as do the rest of the folks who were there for the few days we had the house. We have been staying at the Berry Home for 18+ years !It's our home away from home !!! The views and location are amazing and the furnishings are very comfortable. Great home to spread out and enjoy family time! Nice location but . . . Beds were not comfortable and it took a looooog time to get hot water. That was enough for me to not return to this house even though location was wonderful for views from house and walking through unit. If you can sleep on hard mattresses and don't mind waiting for hot water then i recommend this house -- deal breakers for me. 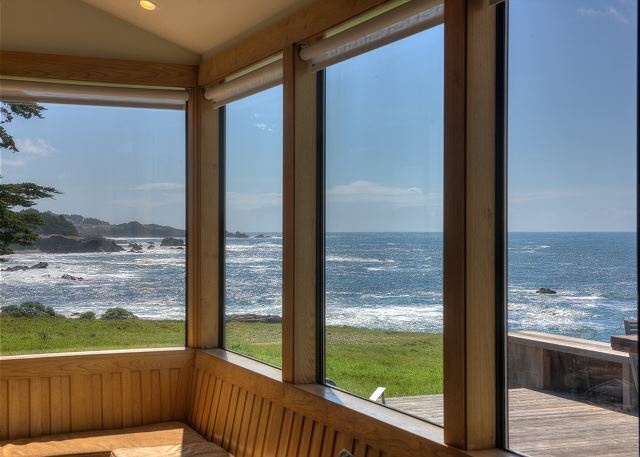 this is one of the most beautiful properties at sea ranch! Large and lovely for family gatherings. Waking up and walking in the living room and kitchen that faced the ocean with big bay windows was amazing! The house felt enormous and was very spacious. We enjoyed our weekend here very much! Especially enjoyed the size of the common spaces -- it was raining and we had a largish family group. The kitchen was an awesome space for many cooks and extremely well supplied. There are Bundt pays in case you are so inspired. The views were awesome with plenty of seating looking over the water. We had a wonderful stay at the Berry house. It was much larger than expected. This house has a maximum capacity for 6, but is actually large enough for 10. The view was beautiful and it was worth the spurge. We had a wonderful stay. I wished it was a little closer to Gualala. The television was quite small but it wasn't really a problem because I didn't watch TV while we were there. All in all I loved it. Beaufitul Oceanviews - private lot! The vacation rental was awesome and everything we expected except the house was HUGE for two of us. We really enjoyed having our own private view of the ocean and being able to walk right out to the bluffs. There was plenty of window seating and gorgeous ocean views from kitche/dining, family room and master bedroom and bath so we felt surrounded everywhere. The kitchen was fully stocked with plenty of utensils, pots/pans so it was easy to cook and prepare food. The chairs for watching TV in the evening were not very comfortable and TV was too far away to watch from sofas. We have been renting the Berry Home for many years. I feel it is our "home away from home"!!! The views of the ocean are spectacular ! Access to trails are close by , we walk for miles along the coast. Wow. What a great house and setting! Sea Ranch is always a wonderful place to visit and get away. We felt very at home at the Berry house and the views were amazing. Thanks for a very special weekend. example, we couldn't find any directions on using the stovetop grill. After going through some hard times, my husband and I spent 3 nights at this amazing destination. It is a great place to reflect, gain perspective, and enjoy fantastic views! Diana was very helpful to make our stay really nice. We've rented many Sea Ranch homes over the years. This is a new favorite for us! We've been renting the Berry Home for 18 years !!! 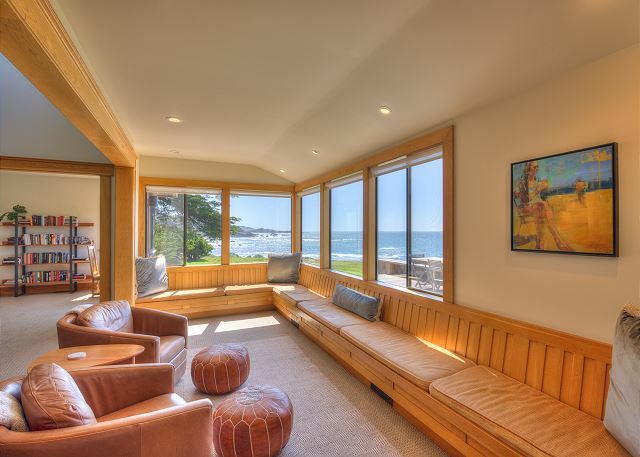 It's truly one of the most beautiful properties in Sea Ranch ! We were very happy in this house. Just watch out for the neighbors! The staff at Beach Rentals were incredible kind and helpful. Our family meets in Sea Ranch once a year. We rent 3-4 other houses in the area but he Berry house is host house. The kitchen is more than complete. The views are amazing at any season. The best place to go and just relax. We've been visiting Berry House for about 15 years. Every visit is marvellous...the home has a magical way of making you relax as soon as you walk through the door. We have been renting the Berry Home for 15+ years and love it as much today as when we first found it !!!! It has all the amenities of home plus a spectacular view and location. We walk for miles and totally relax each time we visit.